Jimin is an adopted child of a rich couple who was unable to bear a child, Diane and Richard . They lived in Detroit, Michigan. When Jimin was 9, he met Yoongi. Yoongi was 13 then. Jimin and Yoongi played in the afternoons in the park, after Jimin’s school and extra-curricular activities. Jimin eventually figured out that Yoongi was homeless and slept in park.He started bringing him food and invited them to his house. When Jimin told his mom about Yoongi’s condition, his mom worked on getting Yoongi as a foster child. However, Jimin’s father, Richard, learned that Yoongi went to the juvi several times and didn’t want someone like him to influence Jimin. Diane, however, convinced Richard. Richard eventually agreed but with reservations. 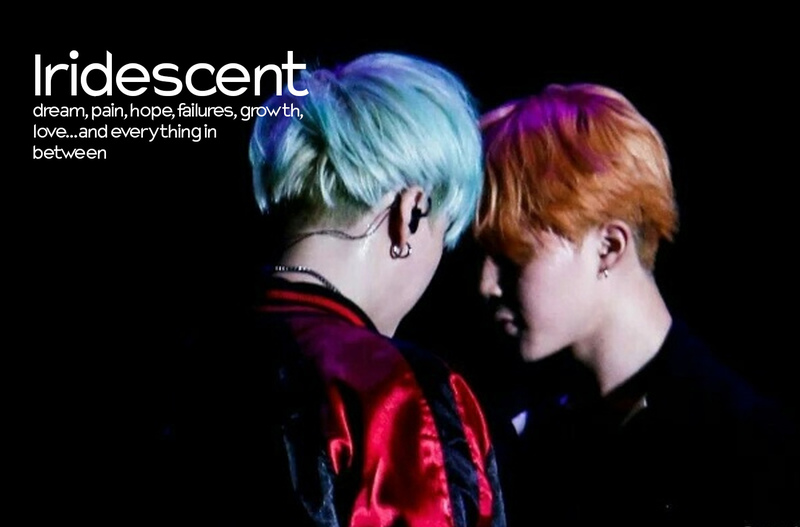 Yoongi and Jimin became inseparable. Yoongi would often accompany Jimin to his art lessons (he likes to draw). Jimin felt bad for making Yoongi wait all the time, so he introduced Yoongi to music. Jimin’s art school also offered music lessons. Jimin knew basics of piano and taught Yoongi. When Jimin realized that Yoongi liked playing, he started buying different CDs of different genre to Yoongi so Yoongi could “figure out the genre he really likes”. Yoongi eventually fell in love with hiphop. Jimin supported Yoongi. With Jimin’s magnetic personality, it was easy for Jimin to make friends with street rappers. Jimin would then introduce Yoongi to them. Eventually, Yoongi started doing street battles and writing his own raps. Jimin’s cousins on the mother side, Namjoon (Rap Monster), also became a regular company because Namjoon was also into hiphop. Jungkook is Namjoon’s younger brother who became Jimin’s classmate after skipping a level. Although not particularly interested in hiphop, Jungkook is very close to Namjoon and would often hang out with the three. Jimin met Jin, a local of Detroit but is already based in LA to pursue his dreams of becoming an actor. Through Jin, Jimin met Hobie (Jhope) who is also into hiphop. Taehyung, on the other hand, is a friend of Jin from LA. Hobie, Namjoon and Yoongi became a hiphop crew and Jin is their “regular vocalist” but refused to be a formal member of the group because he was more interested in acting. Jimin became the tie that binds the four. He would regularly schedule rehearsals and encouraged the three to write their own music and record. He was also the one who came up with the idea of putting their music into CD. Whenever Hobie, Namjoon and Yoongi go to street battles, Jimin would sell the CDs. He sold the CDs in his school, online… basically anywhere. He was also the one who gave the group a name, Cypher. He created their website and eventually started creating merchandise like t-shirts. He was also the one who introduced social media to the three, creating everyone’s accounts and made several posts for them. He manages the group’s band account. Jimin became their unofficial manager. Diane died when Jimin was 14. Richard took it hard and turned into a resentful, rude and hurtful person. He often channeled his anger towards Yoongi especially when he learned Yoongi is bisexual. Jimin and Yoongi looked out for each other. Jimin, knowing that Yoongi was soon graduating from High School, was worried that Yoongi will decide to leave the house and he will be all alone. When Jin encouraged Hobie, Namjoon and Yoongi to move LA, they knew they should make the move and give their careers an honest try. Yoongi, however, promised that he will never leave Jimin. Yoongi took a job in a studio. He started assisting in the studio but took the opportunity to learn more from professional about composition and production. Jimin knew Yoongi was good and felt guilty that he is holding Yoongi back. When Richard started dating again after a year, Jimin encouraged Yoongi to pursue his dreams claiming that his future stepmother is good for his dad and he won’t be alone anymore. Yoongi still refused to leave. Yoongi said he will only leave Detroit when Jimin finishes highschool. Jimin promised Yoongi that he will follow him in LA after he graduates from high school. Hobie, Yoongi and Namjoon decided to move to LA. It is pretty obvious to everyone that Yoongi and Jimin had a “special thing” going on but Jimin is still a minor and everyone thinks that’s what holding back Yoongi. Hobie, Yoongi and Namjoon, however, agreed to continue having Jimin manage their marketing and everything business-related because they just want to concern themselves with the artistic side. Jimin was hesitant but eventually agreed to do his best as long as the group promises to tell him if they find a better manager in LA.